"Warrior" is a beautiful and sweet boy that represents the next generation in our breeding program! He is easy to handle and still very kitten like when it comes to playing! Our continual dedication to keep our breeding program healthy with outcrosses brought us this beautiful boy in 2016. Gladiator is a more moderate style American Shorthair, but we prefer the moderate to the extreme look, so he's just what we wanted! He also has a great disposition, which is equally important to us. 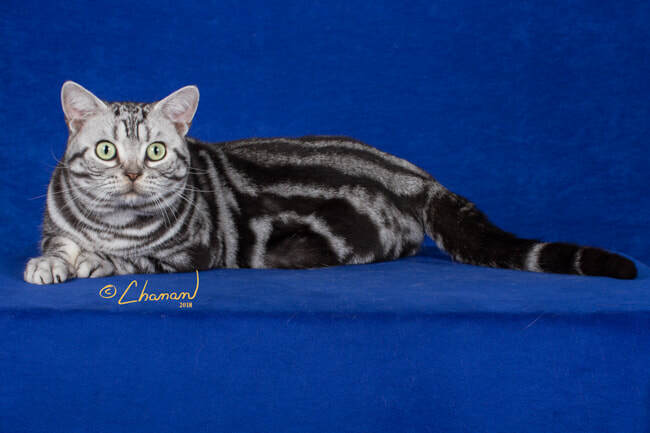 Gladiator was already a siring male by the time he attended his first show - something that only a cat with an excellent sweet disposition could do! He quickly became a Grand Champion and also became a Regional Winner!